The short: 4.5/5 ✦. A supremely entertaining graphic novel series that is goofy on the surface but contains layers upon layers of character exploration. I decided to review all these books together, because individual reviews for each graphic novel would likely be very short and very repetitive. Not to mention short. I had no clue what I was getting into when I starting reading these. I knew of the movie (which, as of this writing, I’ve not seen yet, but I really want to), and I knew it was based on these comic books, but that was literally it. My boyfriend had the first book and let me borrow it. I was actually a little hesitant because I didn’t want to start a series I couldn’t finish, but luckily, my library had the rest, so y’know, all was well. Now that I’ve read the entire series, I totally see what the hype was all about and why so many people love these books. 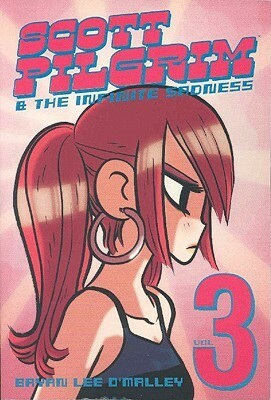 The art style is simplistic but functional in a very unique Western way, though the Japanese manga influences are heavy throughout (seriously, it’s very obvious). The world is basically a video game universe, where you can power-up personal stats, use save points, and enemies explode into coins upon being defeated. This is a bit surprising at first, because the main part of the first book is fairly straightforward slice-of-life comedy situations, and then OH HEY FLAMING SWORDS AND NINJA ATTACKS. After that, the goofy stuff makes more sense and you just go with it. Though there are a lot of characters, the secondary cast (to Ramona and Scott) are wonderfully memorable and fascinating and real. The humor veers between broad and subtle, hitting all the right notes in between. It was hard to tell where this series was going at first. 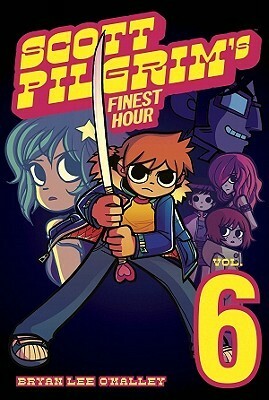 I knew there were only six books, so I figured Scott’s adventure in defeating Ramona’s exes would be the main arc, but it went a lot more in-depth and thoughtful than I was anticipating. Scott is a slacker but still likable, at least in the beginning. As time goes on and more backstory is revealed, you begin to realize he’s a bit of douche. 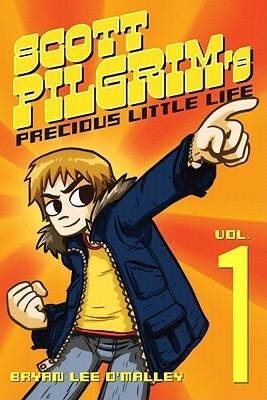 Book 4 is my favorite primarily because, as the title suggests, he finally starts to get his life together. He wants to be a better person for Ramona and actually makes steps toward doing so. 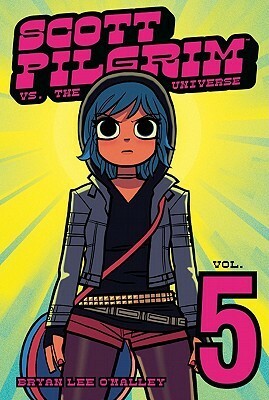 The real surprising thing is Ramona’s character development; though she seems to be the snarky, near-perfect girlfriend, she has just as many flaws as Scott does, and is actually more hypocritical about it. And while Scott represses his memories and refuses to change, she changes herself constantly to outrun her memories. Her magical Bag of Holding – as TVTropes explains – is literally her emotional baggage. There’s a lot of little bits of symbolism and themes like that throughout the series, and I would greatly enjoy reading it again to catch what I missed the first time, especially the last book. I still feel like I didn’t quite understand everything! 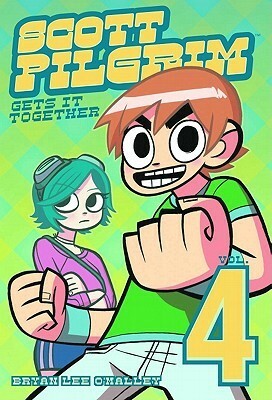 Scott Pilgrim (the series) has its flaws (just like Scott Pilgrim [the character]), and not every story beat hits as strongly as it should, but it really is an amazing set of graphic novels, and I’m so glad I decided to finally read it. I could probably go into more in-depth discussions about the characters and the story and the world and everything (and I’d certainly like to), but I want to keep this review as spoiler-free as possible. But do feel free to start a conversation in the comments! 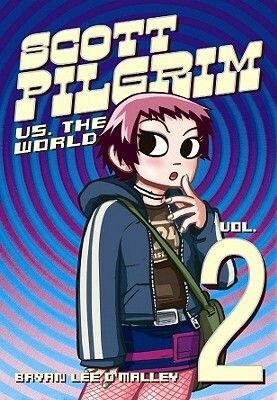 Header image: Scott Pilgrim vs. the World by Bryan Lee O’Malley, published November 1st 2012 by Oni Press.